Rocky Mountain Spotted Fever Pictures: Is It Contagious? What Is the Cause of Rocky Mountain Spotted Fever? Is Rocky Mountain Spotted Fever Contagious? What Are Signs and Symptoms of Rocky Mountain Spotted Fever? What Is the Incubation Period for RMSF? When Should Someone Seek Medical Care for Rocky Mountain Spotted Fever? What Specialists Treat Rocky Mountain Spotted Fever? How Do Health Care Professionals Diagnose Rocky Mountain Spotted Fever? What Are Rocky Mountain Spotted Fever Treatments? How Can People Prevent Rocky Mountain Spotted Fever? What Is the Prognosis for Rocky Mountain Spotted Fever? Is Rocky Mountain Spotted Fever Found Mainly in Mountain Environments? What Should a Person Do if a Tick Is Found Attached to the Skin? Rocky Mountain spotted fever is an illness caused by bacteria that are transmitted by tick bites to humans (a tick-borne illness). The disease is not contagious from person to person. The disease is caused by bacteria termed Rickettsia rickettsii. Three major signs and symptoms are tick bite, fever, and rash; other symptoms may also develop. Medical care should be sought if Rocky Mountain spotted fever disease is suspected. Diagnosis is usually made based upon the patient's history and symptoms, but specific tests are available. Although primary-care physicians can treat the disease, other specialists may be consulted. Treatment is done with antibiotics, usually doxycycline and occasionally, chloramphenicol; note that the Centers for Disease Control and Prevention (CDC) in the United States now recommends doxycycline for RMSF infections in children. Prevention of the disease involves avoiding the risk factor of tick bites. The prognosis of the disease is good if treated early. Published procedures indicate how to safely remove a tick attached to the skin. Rocky Mountain spotted fever is found in many areas; the disease is not limited to the Rocky Mountain area of the U.S.
Rocky Mountain spotted fever (RMSF) is a disease caused by the bacteria Rickettsia rickettsii (transmitted by tick bites to humans) that has nonspecific symptoms of fever, chills, headache, and muscle aches with progression to a rash about five to 10 days after an initial bite by an infected tick. 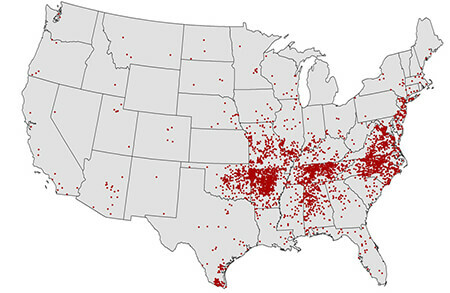 RMSF is the most common fatal tickborne disease in the U.S. Worldwide epidemiology studies show there are about 18 other closely related Rickettsia species belonging to a group (spotted fever group, rickettsial infectious diseases) that cause a similar disease process known by many different names (for example, Boutonneuse fever, African tick bite fever, Japanese spotted fever). 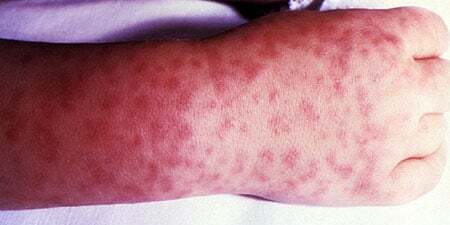 RMSF was first diagnosed in 1896 in Idaho and was first named "black measles" but then was termed Rocky Mountain spotted fever. In 1906, Howard Ricketts showed that ticks were vectors (carriers) of the pathogenic bacteria and in 1909 showed evidence that bacteria (later named after him) caused the disease. Ticks can act as vectors for many illnesses (for example, Lyme disease, tularemia, Q fever) in addition to RMSF. A recent (2017) diagnosis of RMSF in a 2-year-old toddler in Indianapolis, Indiana, led to the child's death. RMSF is caused by R. rickettsii, which are bacteria that are Gram stain negative, aerobic coccobacilli (round and rod shaped) that must live within eukaryotic cells (cells, such as human cells, that have a nucleus bound by a membrane). The organisms only proliferate if they are inside of a eukaryotic cell. In most cases of human infections, the endothelial cells that line blood vessels are the cells that harbor the bacteria. These cells can be disrupted by the organisms, thus producing vascular permeability (leaky blood vessels) that results in macules (flat areas of skin color change) and eventually a petechial rash (red or purple spots about 1 mm-2 mm in diameter usually caused by broken blood vessels). This vascular permeability can occur throughout the body and eventually cause death. Although RMSF is caused by R. rickettsii, the bacteria need to be transmitted to humans by a tick vector (carrier) infected with R. rickettsii. RMSF will not occur in people bitten by uninfected ticks. The following ticks have been shown to be vectors for RMSF: the mountain wood tick (Dermacentor andersoni), the American dog tick (Dermacentor variabilis), and the brown dog tick (Rhipicephalus sanguineus), with the first two as the primary vectors. Other ticks can be responsible as vectors in various worldwide regions. Rocky Mountain spotted fever (RMSF) is not contagious from person to person. The disease requires, in most instances, transfer of bacteria from the tick bite to the individual. Infrequently, some people can become infected with the bacteria if they contact tick droppings or crushed dead ticks. Unfortunately, the early symptoms of RMSF are nonspecific, such as fever (usually greater than 102 F), chills, nausea, vomiting, headache, muscle pain, and fatigue; these symptoms are frequently ignored or attributed to other causes. 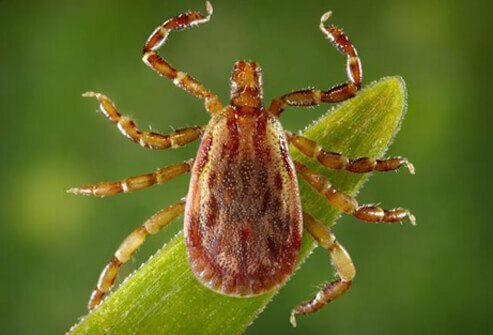 The rash, abdominal pain, joint pains, and diarrhea usually develop about two to 14 days (incubation period) after an infected tick bite. The rash (red spots) usually begins on the wrists and ankles and spreads to the palms and soles of the feet, but some individuals (about 10%-15%) do not develop it. Other symptoms that may occur are loss of appetite, hallucinations, photosensitivity (sensitivity to light), eye redness, and excessive thirst. Unless the patient tells the doctor a tick bite has happened, the doctor may not realize the patient may have RMSF. Children who get infected tick bites may not communicate this important fact to their parents or doctor; likewise, many adults do not remember or even notice getting a tick bite. The classic symptoms of RMSF are a tick bite followed by fever and a rash. If the patient does not exhibit all three symptoms (tick bite, fever, and rash), the diagnosis frequently either is not correct or is delayed. A delay in diagnosis may allow time for severe symptoms and/or complications to develop. Severe symptoms of RMSF are thrombocytopenia (low blood platelets that can lead to internal bleeding), hyponatremia (low sodium), meningismus (a condition of neck stiffness, headache, and possible fever suggesting brain membrane irritation), confusion, blindness, or coma that can result in poor health or death. Anyone who experiences a fever after either a tick bite or a suspected tick bite should seek medical care. Some investigators previously recommend that the individual should also have a rash before seeking care, but since about 10%-15% of infected patients do not develop a rash, waiting for its appearance is not advised. Since most cases of RMSF are easily treated with antibiotics and early treatment reduces or prevents health complications, medical care should be accessed as soon as possible. In areas where most cases occur (states such as North and South Carolina, Arkansas, Oklahoma, Missouri, Tennessee, Georgia, and Mississippi), patients who are immunocompromised and simply get a tick bite should inform their physician and ask the doctor what they should do. The highest incidence of RMSF is in children ages 5-9, and one study reported that about half of the patients did not report a tick bite. Several researchers also state that many adults also fail to remember or report tick bites. This often can delay diagnosis and treatment and may result in poor outcomes. Consequently, if a person gets a fever and has a rash on the ankles, wrists, feet, or hands, medical care should be sought even if a child (or an adult) cannot remember getting a tick bite. Although pediatricians and primary-care physicians can treat Rocky Mountain spotted fever, often the first person to diagnose and/or treat the disease is an emergency-medicine specialist. In addition, specialists such as infectious-disease specialists, neurologists, dermatologists, and/or critical-care specialists may need to be consulted for individuals with severe disease. The diagnosis of RMSF is usually made clinically when a patient's history of their problem includes a fever and a rash (usually on the wrists and ankles first, then to the palms and soles of the feet) that occurs a few days after a tick bite. Treatment should not be delayed while waiting for a definitive diagnosis as rickettsial disease may advance rapidly. Additional pictures of the rash and ticks can be found in the U.S. Centers for Disease Control and Prevention (CDC) web sites listed below. A laboratory test that presumes the diagnosis is done in some patients. It is a biopsy of the skin rash stained specifically to show R. rickettsii in the patient's cells. Another test involves a direct immunofluorescence staining of R. rickettsii in skin tissue samples; it can confirm the diagnosis in about 70% of cases and, in some laboratories, can be done the same day the specimen is collected. These tests can help the differentiate RMSF from other tick-borne diseases such as Lyme disease, typhus, and Ehrlichiosis. Other immunological tests are available but are seldom used (indirect hemagglutination, complement fixation or latex agglutination). In most patients with RMSF, health care professionals will order other tests to determine how the patient is responding to the infection. Such tests are likely to include platelet counts, CBC, liver function tests, renal function tests, and electrolyte levels. A few patients may need additional tests such as a lumbar puncture, CT scan, or an MRI scan, especially if the patient exhibits neurological changes such as meningismus, confusion, or coma. Treatment with antibiotics should begin as soon as RMSF is suspected; the clinical picture described above is enough to justify immediate treatment. Doxycycline (Vibramycin) is the antibiotic recommended by most investigators and the CDC to treat RMSF in both adults and children. Dosage depends on the weight and age of the patient; chloramphenicol is recommended for pregnant females to reduce the chance of tooth and bone malformations in the fetus. Antibiotics are usually given for about five to 10 days or until the fever has been gone for at least three days. Treatment within the first five days results in fever resolution in about 24-72 hours. Severe cases may need additional treatment in an intensive-care unit (ICU) of a hospital for ventilation, blood pressure support, and other life-saving treatments. Other antibiotics (tetracycline and Achromycin, for example) are not the first choice for treatment; doxycycline is the antibiotic of choice. There are no reliable home remedies to replace antibiotic treatment. RMSF is not transmitted from person to person; the disease is transmitted to individuals by the bite of a tick infected with R. rickettsii, so the key to prevention is to avoid the major risk factor -- a tick bite. Researchers suggest that only about 1%-3% of the predominant tick species in the U.S. are infected with R. rickettsii, so not every tick bite can transmit RMSF. In addition, infected ticks can take up to six hours attached to the skin before R. rickettsii is transmitted to humans. Although this data suggests that an individual's chance of contracting the tickborne illness is not high, it is still significant enough that precautions should be taken to prevent exposure to ticks. Ticks are found throughout the U.S., especially where there are woods, tall grasses, and wild animals. Tick bites start to increase in April and decrease in September. The chance of getting tick bites increases when humans and dogs enter such environments at these times of year. Infected ticks on dogs can then be vectors of RMSF to humans. Parents should tuck a child's pant legs into socks to prevent ticks from crawling up the legs (this works for the parents, too); long-sleeved shirts may also reduce exposure. Light-colored clothing allows people to see the dark-colored ticks. People should check their children and their own hair and scalp for ticks after spending time outdoors. A chemical spray containing DEET (n,n-diethyl-m-toluamide) can be sprayed on clothing or skin to repel ticks. Caution is advised, as high amounts of DEET can make children and some adults ill; application instructions should be followed carefully. Acaricides (chemicals that kill ticks and other disease vectors) have been used to reduce tick populations; some biological agents (for example, fungi and/or nematodes) have also been used, but all of these methods seem to only be useful in small areas. Currently, there is no vaccine available for RMSF. However, if a person becomes infected with RMSF, the patient can develop an immune response to R. rickettsii that seems to protect the individual from the organisms, but the length of time that this immunity lasts is not well documented. Most patients diagnosed and treated with appropriate antibiotics early in the disease do well and have mild or no complications. However, if the diagnosis and antibiotic treatment are delayed, serious complications can occur. The complications can be varied; they can include long-term health problems such as nerve damage that results in hearing loss and paralysis, meningitis, blindness, brain damage, clotting problems, tissue gangrene, amputation, kidney, heart, or lung failure, and even death. Older patients usually do not do as well as younger patients, and patients who develop the major symptoms very soon after a tick bite (about two to five days) have a worse prognosis than those patients who develop symptoms later. If diagnosis and treatment are delayed, the mortality (death) rate even with treatment can be about 3%-5% and reportedly as high as 9% in patients over the age of 70 according to one early study. Currently, the mortality rate is lower (less than about 0.5%) according to the CDC. RMSF was first reported in the U.S. in 1896 in people living in the Rocky Mountains of Idaho and was eventually named after that region. Some investigators suggest the name is misleading because the disease currently is found in most of the U.S. states, with North Carolina and Oklahoma accounting for a total of about 35% of all U.S. cases. States containing the Rocky Mountains (for example, Idaho, Utah) have about 0%-3% of cases. Additionally, almost every area in the world (except Antarctica) has reported the disease syndrome similar to RMSF and has isolated Rickettsia species very similar to R. rickettsii. Before effective treatments were available, reported fatality rates varied from 30%-70%. The age groups at highest risk for infection with RMSF are children under 10 years of age, although any age group can be infected. RMSF has been a reportable disease since the 1920s, and about 250-1,200 cases are reported each year. From about 1972 to about 1990, the average number of cases per year was high (about 1,000) and then decreased until 2001, when the case numbers again climbed and have remained at about 1,000 per year. Recent data suggest the numbers of cases are increasing. 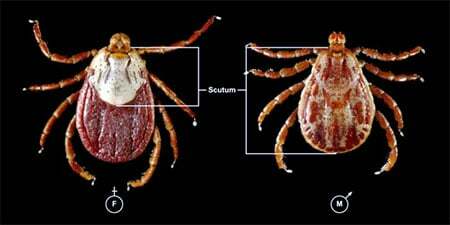 Ticks infected with R. rickettsii sometimes take as long as six hours to transmit the organisms. Infected ticks are not distinguishable from noninfected ticks by visual means, so all ticks should be removed from the skin as soon as they are discovered to reduce the chance of getting RMSF. The CDC recommends the following: After protecting fingers with gloves, use fine-tipped tweezers or a notched tick extractor to grasp the tick as close to the skin as possible; slowly pull upward and do not twist or jerk the tick as this may cause the mouth parts to stay in the skin; if mouth parts remain in the skin, remove them with tweezers; disinfect the bite with iodine, rubbing alcohol, or detergent; save the tick in a plastic bag in the freezer in case RMSF symptoms develop to assist the doctor in making a clinical diagnosis. In addition, do not crush the tick as this may release R. rickettsii onto the skin or into the bite. The CDC further suggest that using methods (for example, petroleum jelly, lit matches) other than those described above may cause the tick to release fluids immediately that contain R. rickettsii and thus increase the chance for RMSF infection. Avoid grassy areas and shrubs where ticks may be lying in wait to tag a ride on a potential "meal." Avoid tick season completely by staying away from outdoor areas where ticks thrive, usually during the months of April through September in the U.S. Wear light-colored clothing so ticks can be easily seen, and brush them off. Tuck pants into boots or socks. Apply insect repellant, specifically the brands designed to repel ticks. Follow label instructions. Avoid use of DEET-containing repellents on children. Carefully follow instructions and apply some repellents directly to skin and others to clothing. United States. Centers for Disease Control and Prevention. "Rocky Mountain Spotted Fever (RMSF)," May 15, 2017. <https://www.cdc.gov/rmsf/index.html>. What symptoms and signs did you experience with Rocky Mountain spotted fever? How was your Rocky Mountain spotted fever treated?